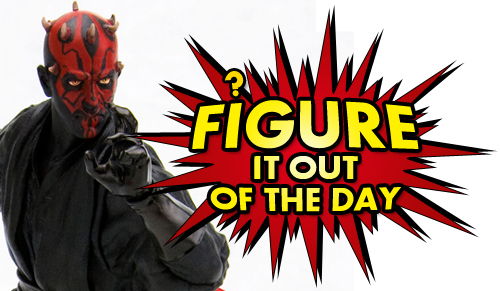 Today's Figure It Out Of The Day for Wednesday, May 16 is "On May 14, 2012, we kicked off a contest to win a Star Wars Darth Maul ArtFX+ Kotobukiya Statue. Who is providing that prize?" If you plan on winning this Kotobukiya Darth Maul ArtFX+ Statue from FigureoftheDay.com, then you're going to need to learn how to time travel as well as hone your detective skills. When you visit the Toy Sale Boat Facebook page, you should see a navigation column on the right. This feature allows you to easily transport back in time through the hundreds of sales posted over the last two years. Each day, for the rest of May, a new Figure It Out trivia question will be posted on the Toy Sale Boat Facebook along with a corresponding date that you will want to time travel to. Use the navigation panel to quickly zip to the exact year and month referenced in the clue. From there it will be up to you and your detective skills to Figure It Out. Entering is easy. First, Like Toy Sale Boat on Facebook. Next, keep checking back every day on the Toy Sale Boat Facebook page for a new Figure It Out trivia question. Use the clues provided to look back through past Facebook posts to find the answer to today's trivia question. When you think you know the answer, use the Message button on the Toy Sale Boat Facebook page to contact us. Your message should include both the question and answer for today's Figure It Out trivia. You may enter once per Figure It Out trivia question. It only takes one entry to win, but multiple entries will obviously increase your odds of winning. One winner will be selected after May 31, 2012. This giveaway is limited to US residents.